Business to business software can be a tough sell. Online B2B can be even a harder sell. While there is certainly money to be made, unless you’re one of the big players, the likelihood you’re going to succeed is pretty small. Starting today, Google is taking their roll as one of the big players and extending a platform to boost some smaller players. 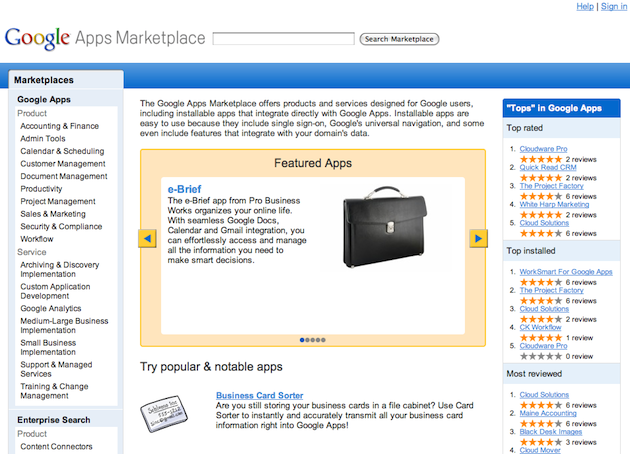 Tonight, Google has unveiled their Google Apps Marketplace. This is an app store for enterprise apps in the cloud. Using a set of APIs, these third-party apps can deeply integrate their products within Google Apps, which already some 25 million people are using. And that also includes over 2 million businesses ranging from startups, to small businesses, to Fortune 500 companies. 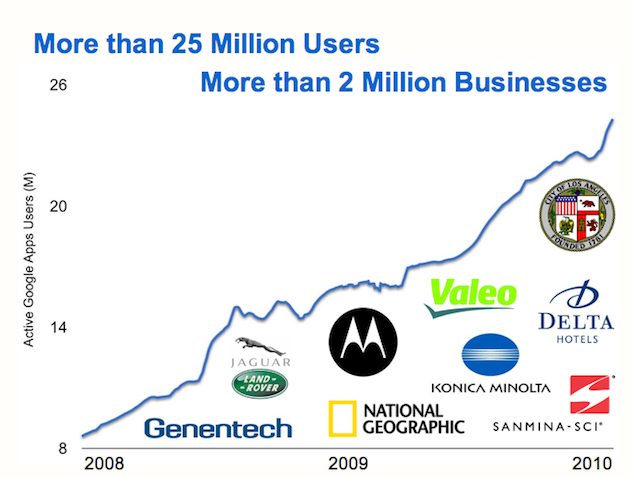 For customers, this means a one-stop shop for a variety of applications that their business or organization can use. And it’s extremely simple to get started with apps in the marketplace — it just takes 4 clicks, Google says (though that initial click will have to come from your domain admin to approve the use of the app). For developers, particularly small startup developers, it means instant access to more users than they can likely imagine. It also potentially means something more important: money. Like the popular mobile app stores (Apple’s App Store and Google’s own Android Market), Google is allowing developers to sell their apps through this Marketplace. And they’re actually offering a better deal: Google will keep just 20% of the revenue, while the developers keep the other 80% (compared to a 30/70 split with the Android Market). The reason for this better split is that Google believes the B2B market is a bit different, and they want to entice developers to join on board. And instead of Apple’s App Store, which charges a $100 yearly fee to developers, Google is charging a one-time fee of $100 to enroll in the program — and that’s for as many apps as you want to create. As for what Google will do with their 20% share, they’re not entirely sure. “We don’t know what will happen with the revenue, but we think it’s a very fair rev share for the value we’re providing,” Google Vice President of Engineering Vic Gundotra says. Grant access to the data that the app is requesting. Some apps require data access, some don’t – only grant access to apps you trust. So how does this all work? 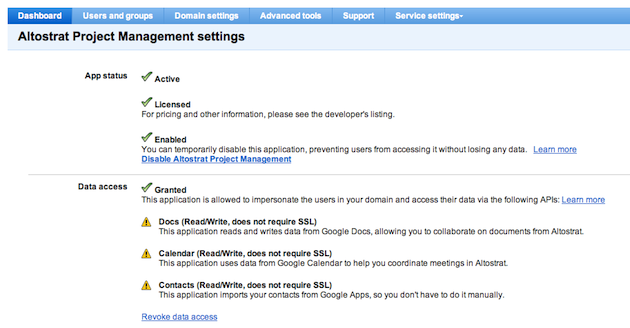 Google connection points for integration into Apps are actually done through open protocols such as OAuth. And while signing-in may seem like a pain across different apps, Google has streamlined that as well thanks to another open protocol: OpenID. Once an app is hooked in to Google Apps, it will appear on your main Apps Dashboard alongside the other Google-made apps you use. 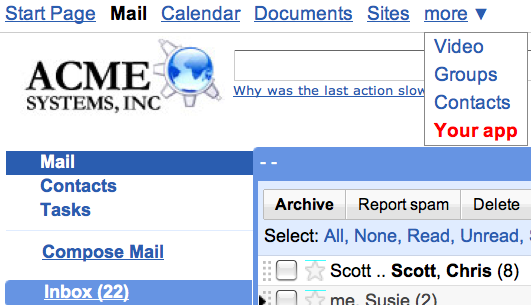 It will even appear in the “more” drop down that Google uses in the toolbar across its properties. 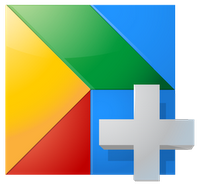 And because these apps are so tightly woven into Google Apps, they can take advantage of the built-in Google Apps such as Gmail and Gtalk to easily communicate within the third-party apps. And there’s more. While it’s not quite ready to launch just yet, in the second half of 2010, Google plans to launch flexible billing options for third-parties using their services. Basically, this will allow companies to use Google Checkout to handle complicated billings, such as subscriptions. This could mean trouble for startups specifically in this space, such as Recurly. Also coming later will be detailed analytics for transactions, we’re told. For now, developers are free to hook up their data to their own analytic programs to run their numbers. While Google’s options for this Marketplace sound nice and open, there’s actually something even better: you don’t have to build your apps on their platform. Whereas a big player like Salesforce wants to keep the apps it works with in the Force.com ecosystem, Google doesn’t care where you build it — it can be on App Engine, or on anything else. You simply hook your app up to the APIs and you’re ready to go. It’s a model so enticing that even a big Google competitor in this space, Zoho, is ready to work with them, and is launching as an initial partner. All told, there are more than 50 companies partnering up at launch, including a winner of the audience award at this year’s TechCrunch50, Socialwok. As to whether Google could eventually roll this app store model out to the more consumer facing apps they offer, Gundotra gave me the old, “We have nothing to announce at this time.” That reads suspiciously to me like a “yes,” provided this is the hit it seems like it should be.